(CNN) - Arguing the election cycle has too many presidential debates, Rick Perry's top spokesman said the Texas governor could use more time with voters instead of taking the stage with Republican opponents. "We're about 60 days away from votes being cast," communications director Ray Sullivan said on CNN's "John King, USA" Wednesday. "The candidates need to spend time in Iowa doing those town halls and spending a lot more time with the voters, who oftentimes have the best questions and press the candidates the hardest." Citing the dozen-plus debates in the works, Sullivan added: "There's no way that the candidates can do all those debates." Perry, whose poll numbers have slid after a series of uneven debate performances, made headlines Tuesday when he described taking part as a "mistake." "These debates are set up for nothing more than to tear down the candidates," Perry said on Fox News. "It's pretty hard to be able to sit and lay out your ideas and your concepts with a one-minute response." Sullivan confirmed that Perry will participate in a debate on Nov. 9, hosted by CNBC with the Michigan Republican Party and Oakland University in Rochester, Michigan. "But look, we're taking each of these as they come, examining the schedule and examining the opportunities and the opportunity costs," Sullivan told King, CNN's chief national correspondent. Sullivan said the Perry campaign needs to be in several key battleground states, including Iowa, New Hampshire, South Carolina, Florida and Nevada. "We certainly respect the process, but when you've got eight of nine candidates and 30 seconds to a minute, it takes valuable time away from campaigning in Iowa, as those elections approach," Sullivan said. Filed under: 2012 • Rick Perry • TV-John King U.S.A. I watch the debates to see how they do under fire. The last debate was the worst as far as the petty bickering went. My feeling about Perry now is that he doesn't like sharing the stage with anyone, he has to be the biggest guy or he's diminished somehow. If he's unwilling to debate, then we are unwilling to consider him potential president. His campaign is dead. Translation: Perry doesn't have a clue how to debate and if he can't make everything revolve around his imaginary sky fairy he has no chance. On this issue, I agree with Perry. These debates don't do alot except a school yard fight . Granted these debates are more and more made for television in this ridiculous Reality television culture we now live on, what Perry really dislikes is being exposed as the fraud and mental dud that he is. The debates negate his ability to manipulate and micromanage his way to the White House. Interesting he only decided on skipping some debates when he started dropping in the polls. Maybe there's too many debates because everybody started running for President about 2 years early. So the "ken" doll is going to shut up ? How about just skip the election? Well he's right of course. The whole debate debacle is just reality TV with politicians and the worst part is, no one watches the crap but the media decides the next day who won or lost and that's what the people go by. He might have a point if it weren't for the facts that 1) debates are supposed to challenge the debater 2) these are really softball debates 3) most of the time is spent bickering and trying to come up with zingers instead of outlining or defending a position. His suits and ties are nice, but he's a terrible debater. and Crony Capitalism is his thang. Whoa, hold on their partner. Everytime I open my mouth, I tell a lie and my ratings go down. Like Bush before me, I welcome all those illegals into my country. They are good for businesss, they work for less money then folks working at MCD and Wal-Mart. I would put a fence up just so they know they are entering the state of Texas and out of their terrible country to the South where all the drug wars are going on. I would have put a fence on the othersides of the state, but don't want to slow them down reaching our other fine southern states. The other day when I mentioned 20% Flat Tax, I was using that as an example, it might be 30%, it might be 10%, and it won't be my fault if the congress and senate shoots all my white house proposals. As far as health care and social security goes, folks should work till they die and not need to be drawing social security or social medicine. Romney believes the same, he just won't admit it. If I am elected as the presidential candidate, I will pick Romney as my VP because he would do the same thing for me. "I want to hang out with people that won't ask me hard questions"
Everyone of these candidates has enough money to fly wherever they need to on a moments notice to campaign. I would think that if you are secure in your stance and are well educated on your views of all the issues that Americans care about (or are told to care about) you would rather pit those views against your opponents in a nationally televised event. I'm fairly certain voters in Iowa, New Hampshire, South Carolina, Nevada and Florida all have some sort of television access. I don't even know why he would want to win the presidency instead of staying Governor of Texas; he's spent the last 3 years remodeling the Governors mansion after a relatively small fire all while renting another mansion, excuse me, while the people of Texas rent him another mansion. What a terrible excuse to try to cover his own lack of intelligence. 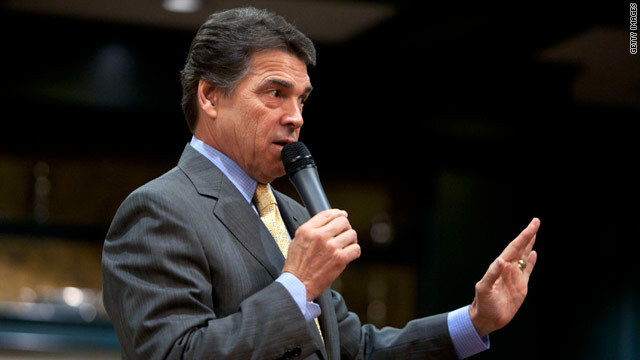 Rick Perry thinks he's so special, he doesn't have to do debates. Laughing out loud. He is absolutely pitiful..